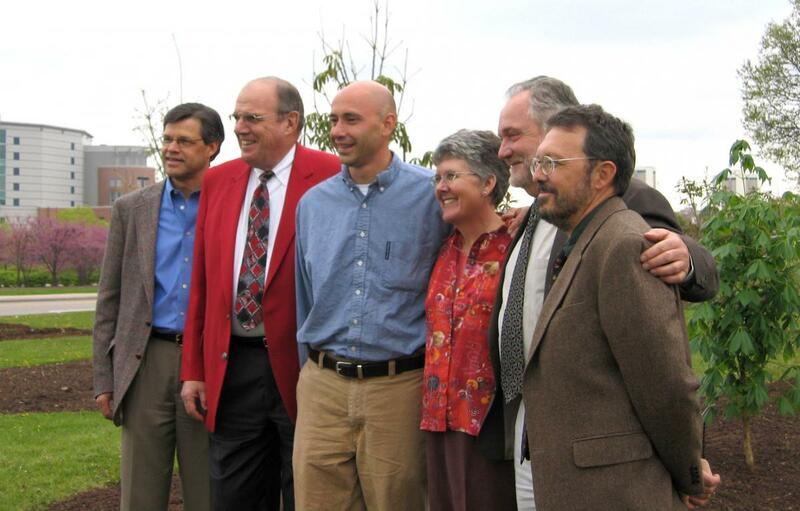 On Arbor Day of 2005, the Buckeye Collection was dedicated to Andy Geiger, retired Director of Athletics at The Ohio State University. Geiger, an avid amateur gardener, was beloved by students and athletes alike. What is a university named for a tree without a grove dedicated to that species? In the Chadwick Arboretum & Learning Gardens we have such a collection. Visitors will find the Ohio buckeye (Aesculus glabra) flanked by yellow buckeye (Aesculus flava), red buckeye (Aesculus pavia), bottlebrush buckeye (Aesculus parviflora), and Autumn Splendor buckeye (Aesculus xarnoldiana). The observable diversity of native buckeyes in this collection expresses the ornamental attributes possible when grown within Ohio’s climate. The Chadwick Arboretum planted the Aesculus collection of native buckeyes as part of the Donald Mayhew Memorial Grove. Mayhew, who had a strong passion for trees, was a former Ohio State student, taken from family and friends while defending our country during World War II. The Buckeye Collection honors the retirement and horticultural achievements of Ohio State Director of Athletics, Andy Geiger. Attending the dedication were many Ohio State alumni, friends and family. The dignitaries present at the event shown in the photograph, from left to right, are Dr. Stephen C. Myers (assistant director of the Ohio Agricultural Research and Development Center (OARDC) from 2005-2012), Andy Geiger (Director of Athletics from 1994-2005), Mike Pfeiffer (Chadwick Arboretum horticulturist), Mary Maloney (currently, Director, Chadwick Arboretum & Learning Gardens), Rich Pearson (former Chadwick Arboretum horticulturist and guest speaker for the event), and Pablo Jourdan (current Director, Ornamental Plant Germplasm Center). The Buckeye Grove tradition on the Columbus campus began in 1890 with the planting of a buckeye tree in honor of the first OSU football team. 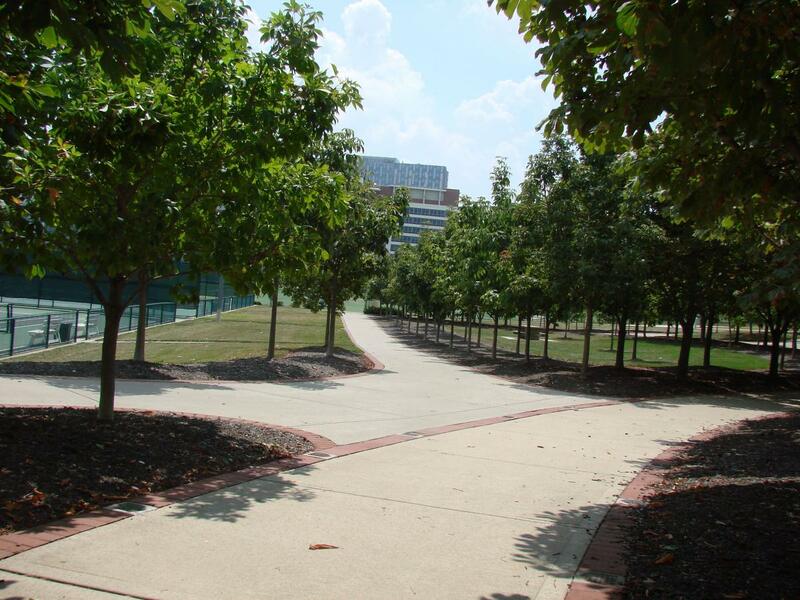 Beginning in 1965, the buckeye trees were planted to honor OSU All-American football players. 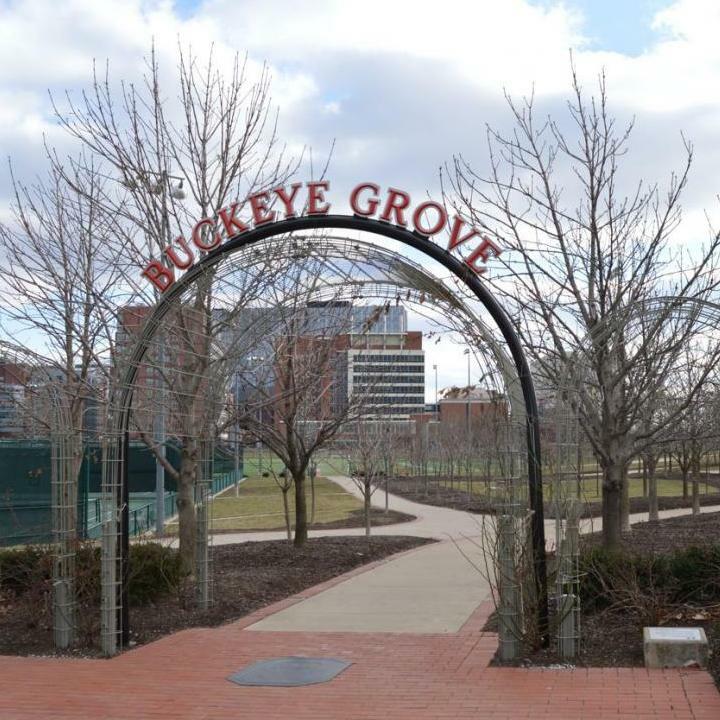 The grove was located on the southeast side of Ohio Stadium but was moved to a site south of the stadium and east of Lincoln Tower following the renovation of Ohio Stadium. The genus Aesculus includes both buckeyes and horsechestnuts. While there are no native horsechestnuts, there are native buckeyes. All varieties have palmately compound leaves (each leaflet is attached to a common point, and resemble fingers attached to a palm). Most have 5 – 7 leaflets. Leaves are arranged opposite one another on stems. Flowers are arranged on spikes (panicles) and can be quite showy. Both buckeyes and horsechestnuts are prone to leaf diseases (leaf blotch, powdery mildew) that can make trees highly unattractive by mid summer. We recommend using species that are resistant to these problems. Aesculus glabra – The Ohio buckeye is the official tree of The Ohio State University and the State Tree of Ohio. Unfortunately, it is highly susceptible to leaf scorch and is not recommended as a landscape tree. Flowers are cream colored and appear in spring. Fruit are the easily recognizable "buckeye." Aesculus flava – The yellow buckeye is more resistant to leaf diseases and is a better choice as a landscape tree. However, this tree can grow quite large and can reach 100 ft. tall. Yellow flowers appear in spring. Aesculus pavia – The red buckeye is more resistant to leaf diseases and is also a better choice as a landscape tree. Grows as a large shrub or small tree, reaching 20–30 ft. tall. Showy red flowers bloom in spring and attract hummingbirds. Aesculus parviflora – The bottlebrush buckeye is a shrub form, growing 8–12 ft. tall. Showy white flowers in July. It is not troubled at all by leaf diseases. Aesculus xarnoldiana 'Autumn Splendor' – The Autumn Splendor Buckeye is a hybrid cross of buckeyes. It has better green foliage in summer and maroon-red fall color. It can grow to 30–40 ft. tall. Yellow flowers appear in spring. Click on the Aesculus tree names above for a photograph and one or more links to information about these trees from The Ohio State University Plant Facts, Wikipedia, and/or USDA Plants Database. Or click Plant Search Database and simply enter the botanical name (genus only will work) of any tree on The Ohio State University Columbus campus. If you do not know a tree's botanical name, you can find it by searching the web using the tree's common name. We are in the process of adding QR codes to our plant labels throughout the arboretum. If you are walking in the gardens and see a plant label with a QR code, use your smart phone or tablet QR reader app to access a photograph and description or link to additional information about the tree. If you don't have a QR reader app, you can download one for free from your app store.